Scottish Tradition Volume 27: Sguaban A Tir An Eorna - Traditions Of Tiree, The Scottish Music Shop - The Best Selection of Scottish CDs and Scottish DVDs. Tiree, a low-lying island of some thirty-six square miles west of Ardnamurchan Point, lacks the mountains and hills of its Hebridean neighbours. Currently its population is about 650, although on the first half of the nineteenth century it peaked at around 5,000. 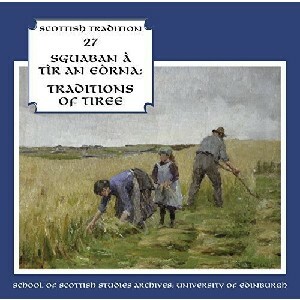 The oral tradition of Tiree began to be recorded by The School of Scottish Studies soon after its inception in 1951. Its first full-time collector and researcher, Calum MacLean (1921-1960), visited in 1953 and his recordings are the earliest from the island in the Sound Archive. Next to record was Dr Hamish Henderson (1919-2002), followed by several others. This CD cannot include items from all the men and women of Tiree who have contributed to the Sound Archive over the years but the contents are representative of an island where memories of the past have remained strong amongst those with special gifts, interest and skill.